It has now been a couple of months since I took the PTE exam for the second time, but I still find myself thinking about it quite a lot. It’s not so much a test as an experience— one I am not likely to forget anytime soon! My PTE adventure was a bit of an emotional roller-coaster (read about how I failed the PTE and then got a PTE 90), and in the end, I took away two very important lessons. I would like to share them with you here because I think they’re important to consider before you go in. I sure wish I had known them before I wrote the PTE exam for the first time! The first time I took the PTE exam, I assumed that as a native speaker I could just “see how it would go” and still come out with top marks. Unfortunately, I was very wrong, and this was reflected in my scores. Here is the problem: many people think to themselves “I speak great English, I have top marks in English at school and I practice with my friends all the time! An English proficiency test should be a piece of cake!” Here is the problem with that logic: English proficiency tests are not just about English. My PTE Scores on My First Attempt. There you have it, the secret is out! Remember, the PTE exam exists to assess your ability to operate in a completely English environment, be it a workplace, a university or a training program, and to do this you must be skilled at critical thinking, social interaction and problem-solving. My old French teacher used to say, “it’s one thing to speak another language. It’s another to be yourself in another language”. I don’t think truer words have ever been spoken. Not only do you need to prove your proficiency, you need to prove your skills and strengths in a language that is not your own. 1. Assess your skill level. Find practice questions and material (a great place to start is our PTE free trial) and get a sense of what the PTE exam questions will look like and what you find challenging. One thing that we see a lot at E2Language is people who are unrealistic about their skill level and their timeline. They are completely lost and confused about the PTE test format, yet they’ve booked their test for the next week and are determined that they can improve in an extremely short period of time. IF YOU ARE IN THIS SITUATION, PLEASE RECONSIDER WHAT YOU ARE DOING!! This kind of thinking is a recipe for disaster. I know there are deadlines, I know you think you need to do it sooner rather than later, but it is NOT worth failing the PTE and losing confidence just because you wanted to get the exam over with. 2. Stop doing practice questions immediately! Now that you know where you stand with your level, it’s time to work on your weak points. Our PTE experts can help you with this. 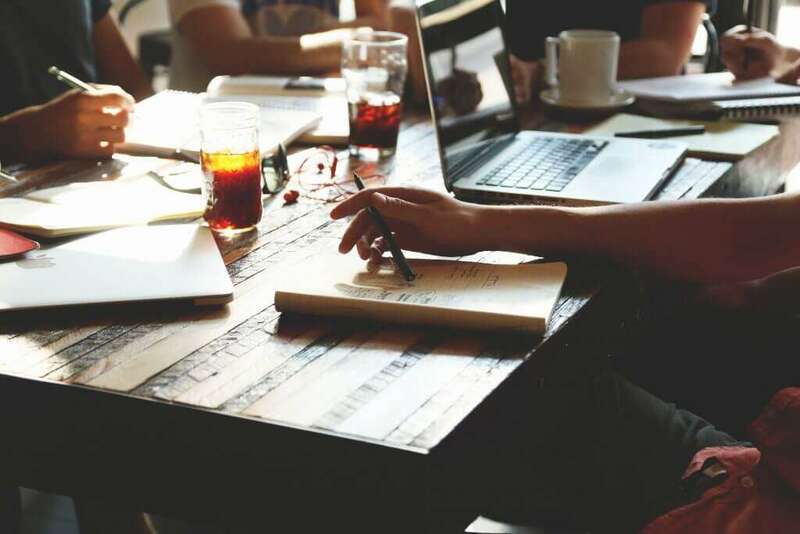 Not only can they work with you to create a realistic study plan that suits your needs and timeline, they can provide support in the areas where you struggle most. Many people don’t realize that they struggle in a broad area like reading or writing because they lack or have forgotten the building blocks (like basic grammar, sentence structure or format) that these broad skills are based on. Our teachers can identify the missing building blocks and help you add them to your repertoire. Practicing questions over and over won’t help you improve or get the PTE test result you need. Building on your knowledge will. If you’re looking for free resources, check out our free PTE webinars and the PTE activities available on this blog! 3. Reassess yourself. After you’ve worked on your skills, you’ll need to know where you stand again. Feedback from your E2Language tutor is an excellent way to assess your new level. Now is also the time to try out some more practice questions and get a sense of your improvement. Once you are comfortable with your improvement in your weaker areas, it’s time to get serious about practice questions. 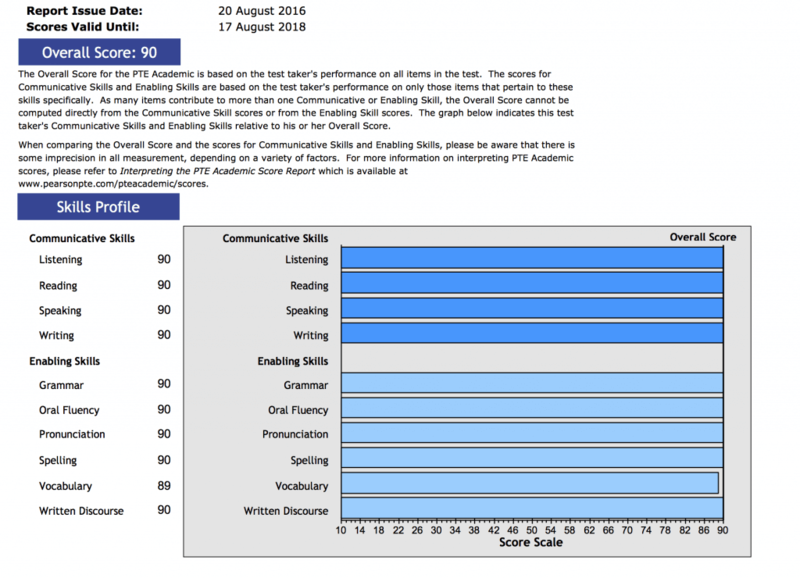 My PTE Score After Skill Building and Using the E2Language.com Methods! I really don’t want to scare you, but I also want to be completely honest; the PTE exam centres are not even a little bit fun. They are stressful environments filled with nervous people, security measures, and (most importantly) lots of NOISE. I’ve said this before and I’ll say it over and over again: most of us do not prepare adequately or appropriately for this environment. We are trained to find quiet, comfortable places to study, and PTE exam centres could not be further from this setting. You must sit in a cramped cubicle for over 3 hours with the deafening sounds of other voices and frantically tapping keyboards surrounding you. You can’t eat or even drink water during this time, and any stretches or excessive movement you make could put you under suspicion of cheating. 1. You need to get used to studying in chaos. 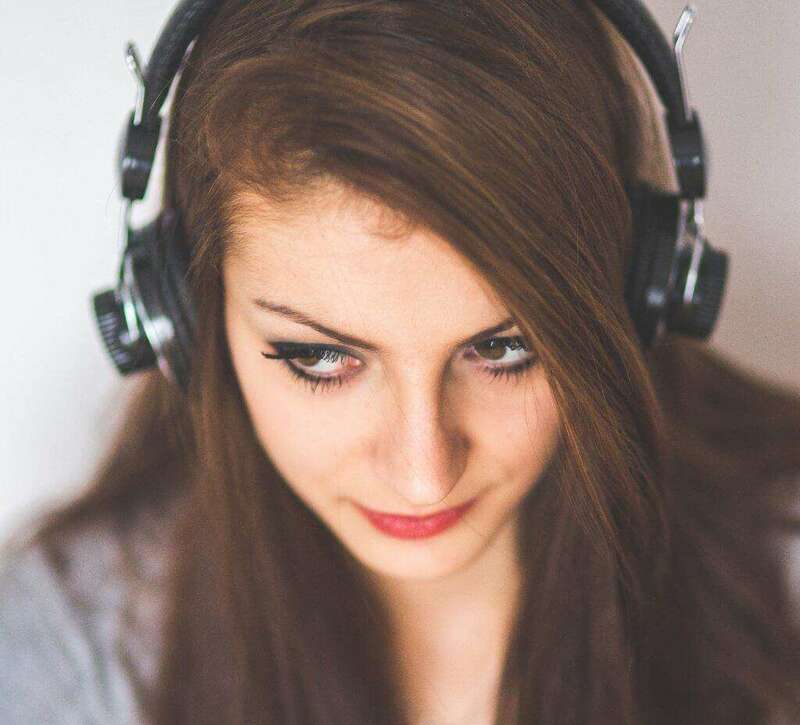 Record yourself practising a speaking task in a bustling café, try a reading exercise on a noisy tram, or listen to fascinating podcasts in a public park with an outdoor band playing 10 metres away. It sounds a bit silly, but I promise you it will pay off. Your brain will start to get used to tuning out irrelevant information and focusing on the task at hand. It will be frustrating at first, but you will notice a difference in how you handle distractions. 2. Along the same lines as training your brain to tune out chaos, you can try a nifty trick I learned back when I worked in a neuroscience lab. Instead of rushing through the PTE instructions and starting the speaking section as soon as you can, take your time. Wait until you hear people around you begin their speaking tasks, and give yourself another minute after that. Your brain will do this amazing thing called “habituation”, or in other words, it will get accustomed to the sounds around you and will start to ignore them. This will make it a lot easier for you to focus on your own task at hand. When I wrote the PTE for the first time, I was the first to begin the speaking section. It was going okay until other people started speaking, and then I was completely thrown off. Why? My brain did something called “sensitization”. As soon as a new stimulus was introduced (in this case, 5 other voices booming through the small space), my brain fixated on it and allowed me to become distracted. The second time I wrote the PTE, I was the last to begin the speaking section and I noticed a significant difference in my level of concentration and focus. 3. Take the PTE earlier rather than later. Again, this is basic neurobiology. Your brain activity is at its peak in the early morning, and around lunchtime it declines rapidly along with your body temperature, making you sleepy and less responsive and productive. Jay and I took our first PTE at 12 pm after eating lunch and I’m pretty sure I almost dozed off by the time I got to the listening section! I did my second PTE exam attempt at 9 am and I felt sharp, alert and ready. I hope my insights can help you on your PTE exam day! Best of luck! Be sure to check out our Free PTE Practice Activities while you’re here. Thank you for the suggestions.. I have my exam this coming Wednesday on 12th October.. I have gone through the material you guys have posted on the website and it has been a great help.. will let you know how it goes. It’s a good news.. I got my PTE result today and I got 90 in speaking. Thank you so much for your help!!! Overall my score is 79 which is exactly what I wanted. Thank you so much.. You guys made my day..
hi i’m navjot can you help me pls, because i give pte exam 2 times but my speaking don’t goes up , in which pronunciation is about 10 and fluency is 46 what i can do ? Can you share your experiences and your tips regarding PTE with me? Because, my test date is 12 august. Share your exam, previous scores, and next exam date! They may be able to suggest which package for you to purchase. Hi my name is Cheng. I’m planning to take the pte probably at the end of April or May but i feel that am not ready. I am not so good in English and that is make low my confidence. How can i boost my confidence? I really wanted to pass the pte exam so that i can work in Australia as a nurse. Please help me on how to start with. Also, i purchased one of your review materials but i feel like it not helping me at all. Please give me some advice because i am losing now my patient on this. Thank you. We want to help you ASAP! Hello please give me some tips in listening i need 6 each in pte and i am attempting this test second time. Its fantastic to see you connecting with fellow students. You can also join the E2 PTE Study Group in Facebook to connect with more students who are preparing for the PTE. how do i join E2 PTE Study Group in Facebook to connect with more students who are preparing for the PTE ? You can request to join the group in Facebook and our moderator will approve your request. Please share your tips with me because I am also a PTE student. Hi, thank you for the suggestions. I wrote PTE thrice 😔 But couldn’t achieve my desired score, again m going to appear on 19th of October . I need 65 in each and overall 65. Can you please suggest me something. I have gone through most of the webinar E2languagae.com. I’m so sorry to hear that! What areas are you struggling most in? If you let me know, I can try to provide tips for those specific tasks. Thanks for your sharing. Just add one point for your second bullet of secret #2 regarding sensitisation and habituation. Although it worked for me from the outset, this method had a minor shortcoming when it came to the final minutes of the speaking section. I started later than others. Things were going right with me used to the chaotic noise in the test room, when near the end of the re-tell lecture suddenly everything around turned silent. I was like… scared of the awkward silence and my mind wandered for a moment. After realising everyone else had done their parts, I gained my concentration back and finished mine. But then again, I might have missed some points in the final lecture. In short, it is essential that we practise to be familiar not only with noise, but also with quietness. This is a really great point, thanks so much for writing your comment! You are absolutely right, silence can be just as awkward and distracting as loads of noise. Sometimes it just comes down to a timing game I suppose. Let us know how your PTE goes, and thanks again for the valuable insights! which are far below my target of 79+. Still, I knew right after the test that I performed poorly in the listening and reading parts. However what I couldn’t expect is that those integrated sections would affect my writing score, like R&W Fill In The Blanks. that much. Besides, the fact that I couldn’t get many points in Re-tell Lecture section influenced my fluency. In fact, I’m preparing to sign up for your course today mate. Thanks for sharing your all valuable posts which I have been notified recently. i)	Is ‘Read Aloud’ part connected with reading section marking rather than only speaking? ii)	Is ‘Repeat Sentence’ part connected with listening section marking rather than only speaking? iii)	Is ‘Retell Lecture’ part connected with listening section marking rather than only speaking? iv)	Is ‘Answer Short Questions’ part connected with listening section marking rather than only speaking? v)	Is ‘Summarize Spoken Text’ part connected with writing section marking rather than only listening? vi)	Is ‘Write From Dictation’ part connected with writing section marking rather than only listening? And How “Written Discourse” works? If those are really relevant for marking, then it is tough to gain good score without performing well particularly in speaking section. Though I am fed up with my result, but I am not giving up. I will register with ‘E2 Language team’ very shortly after identifying my appropriate package. I’m sorry to hear about your PTE results! To answer your questions all together: yes, although there are separate sections on the test (speaking, writing, reading, listening), more than one skill is often assessed at the same time (i.e. “summarize spoken text” assesses your listening AND writing as you said). It seems like you have a good understanding of the multiple skills being tested at the same time! This is why it’s so important to develop a method for answering each question that will address ALL the criteria being tested. As for “Written Discourse”, this essentially means the overall quality and coherence of your writing. You can have grammatically correct sentences that are too basic, too short, or are all the same! This is where the “writing discourse” score comes in. To improve your written discourse, you have to not only improve your grammar and sentence structure, but your ideas and organization as well. I did Ielts academic three months back and got 8 for speaking and listening 7 for writing and reading. Then I did pte academic on last week and my results are unbelievably law. I got speaking 46, reading 59 , listening 69, writing 75. I am desperate now what to do. I need each 8 or equivalent in pte. In pte, I hv to improve more than 30 points for speaking, while 1 total band for writing if it is ielts general. Please what is your suggestion. My speaking is natural in front of a person than in front of a computer. It sounds like you did very well on IELTS- why did you take the PTE academic? Are you not able to use your IELTS scores? If you can use IELTS scores for your requirement, it really sounds like you should try again with IELTS. It’s obviously more suited to you and you already have a good sense of the format. 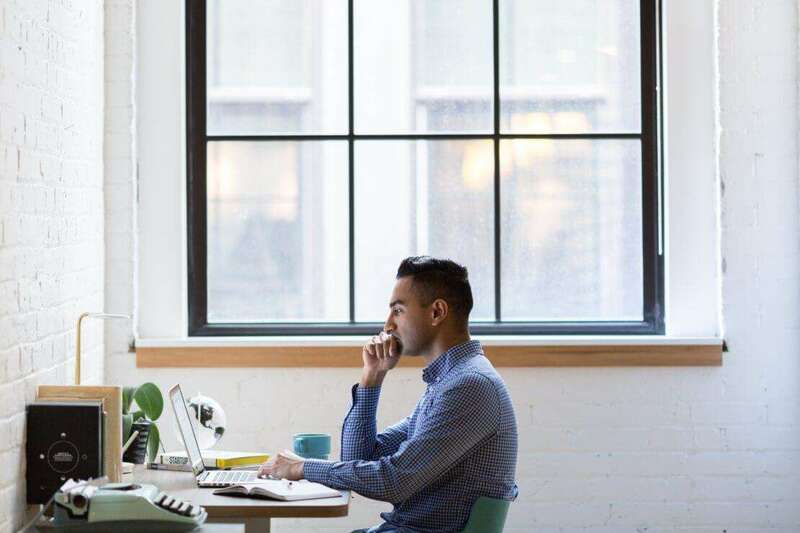 If you have no choice but to take PTE- it sounds like you need to do some serious research about the PTE format and methods. A lot of the reason why people find it hard to switch from IELTS to PTE is because of the format switch and a lack of understanding about how it works. I’ll give you some resources below, but I also really recommend that you look into one of our PTE courses to help get you on track with boosting your scores. Again- if you have the chance to take IELTS, it sounds like a better option. 1 band improvement in writing shouldn’t be too much of a stretch with practice. And our Free trial IELTS course. Thank you very much for the reply . The reason I did switched was I need each 8 to get higher points for immigration . the results that I got from ielts academic was enough for my skill assessment, luckly two 8s and two7s just minimum requirement for teaching occupation. It was third time I tried and finally got it. But now I need each 8 in ielts general. I was doubting when I switched to pte. But everyeone get what they want from pte results. That’s why I also tried. I have never heard anyone got each 8 in ielts .Anyway, do you have a course for ielts general. Letter and essay in particular. I saw you have ielts academic. In ielts, i hv issue only with writing. But in pte, everythin except writing . totally opposite..I have also booked a pte test again for 15Feb as difficult to get a test date if I do it. I feel getting ready for both ielts and pte and try. Do you think it is a good idea. I will have to focus on both at the same time. Sorry I missed this earlier! I’m not 100% sure that it’s a great idea to study for both tests at the same time because they are so different and it might get quite confusing! I would focus on PTE first, then study of IELTS after if you feel PTE didn’t go as well as you hoped. I think one at a time is a better way to go. Did you get your desired result from PTE ? or did you get back to IELTS for fulfilling your required score ? Is there any provision to use our personal headsets (with noise cancellation) during PTE? I love your writing its very neat and easy to understand. I can see why you scored 90 in PTE. Even reading your writing I can improve mine. So many collocations and nice vocabulary. to try out some more practice questions, a nifty trick, etc. Thank you for the video, your ideas clearly reflect what happens in the exam. Good luck with the PTE! I took Pte test yesterday and received the score today. I was aiming for 79 in each module and my scores are below. This is my first attempt and I prepared for about a month using the help of E2language. I would like to redo the test again. Could you please guide me on the areas which require improvement. Can you please send us an email at hello@blog.e2language.come2language.com? If you are a paid member of E2Language, you’ll get a free post-test follow-up with a teacher to make a plan of action and determine where to focus your improvement efforts! If you are a free user, you can send your report card to us and a tutor can make a recommendation to you about which or our courses best suits your needs and how we can direct you to the most useful resources! Just from looking at your scores (you are INCREDIBLY close), I would say that if you took our most basic package and had the opportunity to create a study plan with your teacher and have a one-on-one tutorial on top of using practice materials, webinars and exercises- you could easily boost all your scores well past the PTE 80 mark. It looks like you just need a bit of direction, method and strategy guidance and support from a tutor. Make sure you take advantage of all of our free resources too (like upcoming webinars for free members, youtube videos and blog articles). Good luck to you, you are almost there!! No problem, Nikhil! That’s great to hear. Good luck!!!! I am a paid member of E2Language basic package. I have practiced all the materials the E2L site and followed all the processes during my first test. Still I scored L- 71 R-69 S- 67 W-74 . I need min 79 each. Now I have upgraded to the maximum package “I’m desperate” and going through sessions with Lee, Sasha and David but not getting enough confidence in scoring 79 in actual test. I’m very nervous though..
2. Don’t forget to use all of your speaking and writing assessments. The feedback you will get from your submissions is very valuable! 3. Subscribe to our YouTube channel so you can keep up to date on new PTE tips videos like this one. 4. Subscribe to this blog to make sure you follow all the latest PTE articles. 5. Never be afraid to email us (hello@blog.e2language.come2language.com) with questions or ask us using your Whiteboard. Someone will always get back to you within 24 hours! Remember, you’re part of the E2Language family and we are here for you! Don’t hesitate to contact us with your questions and concerns so we can support you in the best way possible! Thanks a ton Kaia for all your valuable feedback. It would be great if you could let me know the links to get all the recorded versions of the webinars and live mock tests. Where do I get all recorded mock tests? I didn’t all in YouTube channel. Thanks for sharing great stuff. I am also planning to prepare for PTE but i have one question regarding PTE. I had gone through website https://www.pteacademictests.com/pearson-test-of-english/ and find that pte test also have negative marking for few section. Could you please confirm the same ? I failed my first PTE. I’ve got low mark in speaking but high scores in writing and listening and a fairly average mark on reading. My overall score was 56. I would admit that I struggled in Repeat Sentence and Describe Image as the room was noisy and distracting because all of us were speaking all at the same time. Also, I have a very short term memory and I could not repeat the sentence as exactly as I hear it, especially those which are long ones. I am thinking to switch from PTE to Ielts as I think that I am more comfortable speaking to a human face to face and express more of my self than listening and talking to a computer. Is it advisable to switch or will I just improve my speaking and reading skills? 1. Check out the types of questions and tasks on the IELTS exam. You can find practice questions in our blog practice bank or in our IELTS preparation course free trial. 2. Visit the E2 IELTS YouTube channel and watch some of our methods webinars to get a sense of how you will need to practice and prepare for IELTS. I’d also highly recommend that you look into one of our PTE or IELTS preparation courses to help you get on track and build up your weaker skills! Good luck, I hope it goes well next time! Please email us at hello@blog.e2language.come2language.com! Please send across your recent test scores, the scores you are looking to achieve and your next test date to hello@blog.e2language.come2language.com so that we can identify the right package for you. Hi Kaia & Jay. First, let me say thanks for your very useful videos. which came as a surprise to me as I was only aiming for 65 the first time. However what also strikes me is the 20 in spelling I’ve got. I don’t write with perfect spelling but couldn’t help finding that odd, let alone how it does not seem to affect my grammar and writting. I hoped that maybe you can shed some light on this with some analysis and advice. I was wondering if anyone can tell me how much marks one gets in listening if a person does not attempt any question from listening MCQs (both single & multiple correct). For the remaining listening questions he answers all parts correct. To rephrase, how much MCQS contains marks out of 90 for listening part? Could anyone please send me PTE material for preparation, i only have 1 week time to prepare and i struggle a lot in speaking. I’m aiming for 65+ in each module. My last scores were S W R L- 54, 74, 70, 69. Hmm! We hope you’re exam went well. hello i have a big doubt,when we complete read aloud and describe image sections in less than 30 seconds . It is okay if you finish your answer within 30 seconds. To be on the safe side, please click “NEXT” manually after you finish answering. I must also point out that I did face a few technical problems at the test centre. In retell lecture, my microphone stopped even while I was speaking (and there was no 3-second pause from my end) and that cost me. In listening, maybe because of the complexity, I was taking too long on questions and could manage to complete only 13 out of 17 questions – which meant I missed out on ‘Write from dictation’ and possibly one highlight incorrect words. I need to take my next attempt in about 3 weeks as I have to have positive scores (79+ across) in about a month’s time and file my application as soon as I can post that. It’s a race against time and my result right now is giving me the jitters – moreover, the test is not cheap and paying $200+ for each attempt can drive people nuts. Clearing this test and getting 20 points does seem like a daunting task in front of me right now. Please help! Thanks very much for your time and space. We are happy to assist you here. Please email hello@blog.e2language.come2language.com with your questions so that the Duty Tutor can assist you. I took my PTE exams yesterday and this is my second attempt. My scores are Writing 87, Reading 65, Listening 78 and Speaking 44. This is seriously frustrating. I do no what to do now at all. It is like i have spelled all the words wrong throughout my exam. I am not that bad seriously. Please some one suggest me what to do now. Please send across your latest test scores, the scores you’re hoping to achieve and your next test date to hello@blog.e2language.come2language.com so that our Duty Tutor can assist you right away. Just a quick question please. 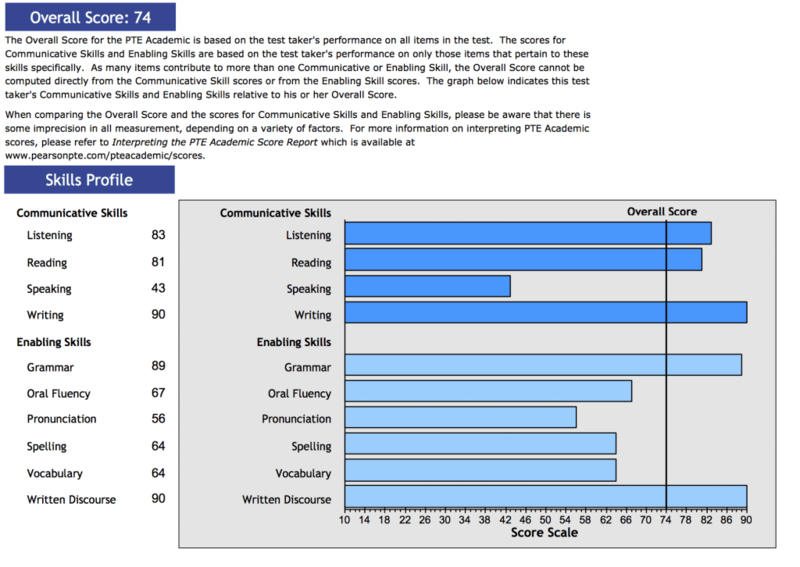 Could you please provide an estimate as to how marks in the speaking section actually contribute to reading and listening scores? I was looking through the marking rubric, and it is clear that many of these communicative skills overlapped in the speaking section. and my required score is 8 for each band or equivalent in PTE. Is it advisable to switch to PTEor stick to IELTS? Thank you for sharing your scores across. From the looks of it, sticking with IELTS seems to be the better option. However, please email your latest score report, the score you are hoping to achieve and your next test date to hello@blog.e2language.come2language.com so that our Duty Tutor can provide further advice and assist you accordingly. Go for PTE I Was struggling to get 6 in IELTS now I got score 83 in PTE .This exam is very easy to score without actually improving our English but to out smart computer .However,speaking is only the one to work and get 79+ score. Thanks for your valuable time & suggestion. Really !!!! I do not think so this is true. It is all about your preparation and what is your level of English. Very less Indians are good in speaking in general. I have appeared in PTE test in September 2017 and my overall score was 68 covering 65 in each section. However now i came to know that i need to acquire 79 in each section to qualify my application criteria. Since i am full time working, i am very apprehensive that whether i would be able to score 79 in each or not? Since i think i am an average student. So can you please guide me on this situation? or put some light that how hard it is to cross the bridge from 65 to 79 each? or much time one should devote to obtain 79 each ? Please send your latest test scores, the scores you wish to achieve and your next test date to hello@blog.e2language.come2language.com so that the Duty Tutor can assist you further. I did my IELTS in OCT 2017 and my score was 5.5 in Reading, Writing, Listening and 6 in speaking. Now I am planning for PTE and would need a 65 score in each individual section. Moreover, I was a regular average scorer in my school days and my English is also not so well. I am actually a bit worried if I would be able to crack it in the first attempt or not. Can some one please advice !! I had taken up my IELTS in Aug’17 and I scored 8 in Listening & Speaking, 9 in Reading and 7 in writing. Though my overall was 8, it is sufficient to get the required rating for my application. Now, I have finished my dates for PTE for April’18, to get a better score or +79 in all the 4 categories to hike my overall rating. But somewhere, after booking my test dates and going through all the formats of PTE, I am beginning to wonder if IELTS is easier than PTE. Can you pls provide me the details of how I can get in touch with E2 Language or any suggestions / guidance on how I can hike my scores in PTE. Please feel free to raise this query with our Duty Tutor here and they would be delighted to guide you accordingly. Sorry to hear about your scores and I believe your current scores are good for a first attempt. Please feel free to reach out to our Duty Tutor to assist you further. You can raise your concern by clicking on this link. Hi, I used your you tube channel to prepare and it was so helpful to me. Then I wrote my PTE exam today. Everything was pretty good even with little mishaps. however, my retell lecture was the most annoying. The noise and distractions was unbelievable. Am really hoping and praying that it does not cause a massive damage to my speaking score. Well tomorrow I will find out. Ahh, that is a very common instance for test takers. I’m urjit from india.My PTE score will expire within 20 days.I am planning for second attempt but i don’t know how can i improve my speaking and listening score. I had scored 49 and 47 respectively in first attempt. I am planning for further study in australia. Specially, i have an problem in “Describe Image” and “Re-tell Lecture”. I can understand what image shows or speaker said but i can’t re-tell in a proper way..please give me any advise so i can crack PTE. We are happy to assist you with your preparation. Hi e2 language, Jay, Kaia and David. I just want to thank your team’s help on making me pass my PTE-A 1st time. I got L-90, R-85, S-90, W-85. The method of e2language really works. I just want to share some of my observations as well. R-your methods really helped here on the reading part, multiple choice. Your mastery of vocabulary will help as well so you can understand the statements faster. Especially for the fill in the blanks. S-fluency is the main key. I remembered I stop for a couple of times to think during describe image and retell lecture. But must keep the words flowing. Make your pause maximum 1sec. Also the intonation during read out loud really helps. It will make you sound like a native speaker. I remembered I wrongly read some plural forms of nouns, should have s, but I didn’t put the s sound at the end but still manage to get 90. I think the intonation is one of the key. W- I admit, I’m not good in writing. But the method of e2language works. Especially if you have a good grasp of the topic which will really help for the words to flow. I got 2 essays which then I thought, this is bad. But the good thing is, the 2 topics were very familiar to me. Quickly I got some good arguments in my head and wrote it down. Don’t forget as well to review the grammar at least for the last minute. Also, if you can take and try the Pearson scored test to get a feel on how the exam works. Will really help. Will also give you the idea which part of the exam you need to focus and to practice more. I’m not a native English speaker. But I can say, the e2 language method really works. Practice more, pray more and have faith from above. Pls tell me only one thing that, the coaching center from where am taking pte coaching, my tutor told me to speak too fast in read aloud module without stopping on any full stop and coma’s to till end of the paragraph. is this a right way to give test ?pls pls suggest. No. Remember a computer grades you on ‘fluency’ which basically means that your speech is easy to understand! It would be hard to understand anyone who doesn’t pause or speak slow enough to articulate. Hi i got PTE Score L-72 R-67 S-84 W-68. I have my PTE appointment next month end and now i m preparing for it and my target is to get 79+ in each module. So, please help me with the tips so that i can improve. Woah! Next month! I totally understand why you’re looking for tips! Please suggest me , how can i get 65+ marks . If you reach out to our DTs through our student support portal they can recommend which package would best fit you! (https://help.e2language.com/support/tickets/new) Just share with them your past scores and goal! (As you’ve done so clearly here) They are fully trained E2 professionals who will best be able to gauge your strengths and weaknesses and help you prepare! This will depend on how strong you feel your Speaking is. The PTE is notorious for its TRICKY Speaking section! If you are confident in your pronunciation and oral fluency the PTE may be right for you! Your article was inspirational, I need 79+ at all costs and only 3-4 weeks to prepare, your tips should go a long way. Anything else you can suggest, please let me know directly so we can expedite my prep which I’m officially starting today in hope of giving the exam a month from now. Hi team E2 language, I gave my PTE twice in the last one and a half month. First time, i got speaking – 90, listening -78, reading and writing -76 each and second time, i got speaking-72, listening -82, reading-79 and writing-86. I am unable to understand, what could have gone wrong in speaking so much. Yes PTE mentioned about the oral fluency but i spoke the same way as i did previous time. I have appeared for PTE 6 times and looking out for 79+. Every time one or the other module gets score less than 79, especially either listening or reading. Can you please help me or suggest some coaching in order to achieve my desired score. Thanks. I have already signed up on E2 language, budget one although, but really don’t know how to control my fear of failing…it’s really hard to control and as i am approaching the test date, less than two weeks, i am getting more and more nervous about it…. I have done my PTE exam 4 times with not hitting my required score of 79. Speaking I am getting 90 all the time but the other 3 sections is what i screw up. The last exam my scores were. Need your help is identifying my weak areas . How can i join a crash course? I had my PTE Academic test last 03-October. During the speaking part, I got disconnected from the test three times (3x). I would like to ask, during the time I was disconnected from the exam, was my time continuously running from the PTE Server?? Hi Jay, I am a subscribed member of the e2language and have my test today at 2pm. Unfortunately I did not come across this tip of taking the test first thing in the morning but registered on the time slot available. I gave my PTE recently and scored L90, R88, S90, W90 . Overall 90. I just followed the strategies mentioned by E2 learning team. I did few attempts prior to this and was able to reach only between 72 and 76 in all modules. I took the silver package. The assessment done by the E2 team helped to understand my mistakes and fine tune those. Hello, I’m Hridesh. Plz can u help me to score 70+ in Speaking section of PTE. I failed to attempt good score in First time and scored only 48 overall . So, can u suggest me some tips & ideas please . Thanks for reaching out Hridesh! We would love to help you! If you are interested in signing up as a paid student with us we can suggest you a package and look at your detailed scores. I want to enroll with E2 language,,, what is the procedure and details? Please visit our website – http://www.e2language.com to get more details. Hi Team, I have taken my PTE exam 3 times. 2nd time scored 65+ in all section except in writing with 64 :(. 3rd time, missed in Listening and writing with 64. can please guide me with tips in improving Listening, reading and writing little more. I have followed the tips and E2 structure given by Jay in the exam for writing. Want to sign up for our packages? I’m Srujan, preparing for the PTE academic. I would definitely require your help and support to crack this exam. This is my first attempt towards PTE. So I request you to help me understand the pattern and support me in having a strategy to crack this test. We would love to help you create your own E2 success story! Please refer to http://www.e2language.com/Course/PTE to find out which package will best suit your needs. I have took pte exam lastmonth which i got overall score 45. I need 79+ in all the modules. Please help me how long do i need a practice to achieve that score and what package do i need to enroll. Please help me thr steps that i need to take. Thanks. So happy you were able to get real value from this post! We really appreciate your feedback and encouragement! We have E2 Duty Tutors who are trained to help exam aspirants pick the package that will be their best fit! I’ve been doing some PTE practice using content in a few websites for over a month now. E2L provides one of the best content, both the blog and YouTube channel. Thanks for the great quality! Have been giving mock tests in a website where I purchased the PTE voucher, but the results (manually evaluated) were discouraging. My score was fluctuating between 65 and 75. Last weekend, I took my first scored practice test (version A) from Pearson’s PTE official site and scored 90 (with only Spelling scored at 81, and so Writing came down to 89). I was actually surprised on seeing this (have cleared cache, rebooted, and verified a few times since then just to be sure 😉 ). My question is: how reliable the results of this practice test are? Is it greedy to expect a similar result in the main test, if not the same, with all the distractions you described in this article? I’m trying not to be complacent, continuing to practice, and also planning to take version B of the practice test coming weekend (few days ahead of my main test) just to be sure there was no computer malfunction in my first.